2-story floor plan features an entry with 21' ceilings and opens to the study and dining room with 10' ceilings. Open kitchen features 42" raised panel cabinets with built-in stainless steel microwave plus oven with separate gas cooktop and granite countertops. 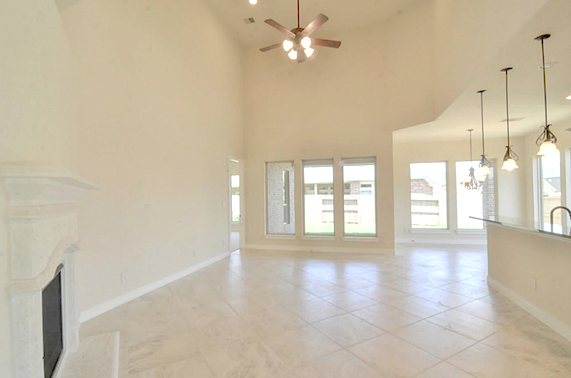 Family room features 19' ceilings and a full wall of windows. Master bath includes corner tub, separate shower and His and Hers vanities. 4 Bed • 3 Bath • 3,054 sq. ft.
4 Bed • 3½ Bath • 3,281 sq. ft.
4 Bed • 3½ Bath • 3,182 sq. ft.
4 Bed • 3½ Bath • 2,924 sq. ft.